It's been very encouraging to see the amount of enthusiasm generated for Brian's recent good news. He and all of us couldn't be happier that all of you have stuck with us through this long challenge, and we look forward to sharing more news about Brian's progress. Please keep on sharing this website on Twitter, "liking" it on Facebook, linking it on Tumblr, etcetera. The more publicity Brian gets, the better his spirits will be! And as you know, he still has a long way to go yet. Thank you for all your support, both financially and emotionally. Without you, Brian wouldn't have the hope he now has! Our man Brian is in the headlines yet again! 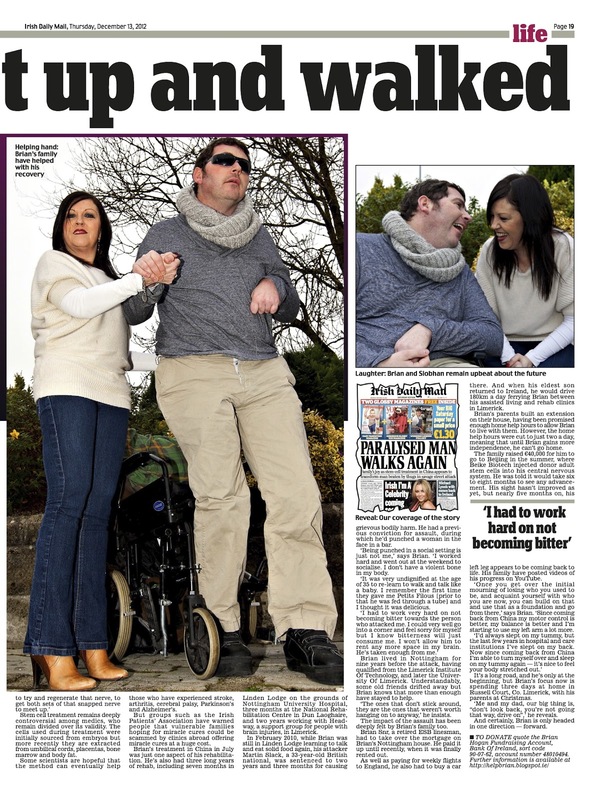 This time in the Irish Daily Mail! 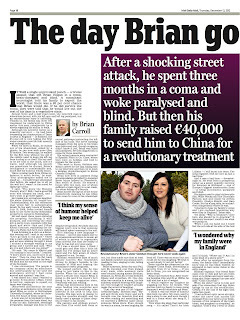 Check out the excellent article by Brian Carroll: "The Day Brian Got Up and Walked." It's Brian's story from the beginning, told in Brian's own words. You can read about the tragic incident that took his vision and mobility, the treatment he's had until now, including the stem cell treatment in China, and the pain and, most importantly, the hope he and his family now have at his recovery so far. Again, deepest thanks to all who have made hope possible! Thanks to your generous donation and a lot of hard work on Brian's part, here are some results from his stem cell therapy! 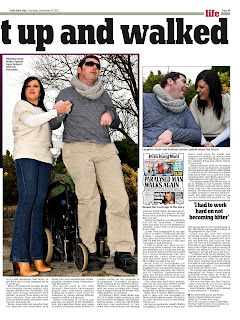 Previously confined to a wheelchair, Brian can walk! He only needs a little bit of guidance since he still can't see. If he recovers any vision, that will be a late result. Meantime, Brian and all of the rest of us are thrilled at the progress he's made. Thanks to you all! It's our last day in China. Back in Beijing. We checked into an airport hotel. Our flight back to Ireland is at 10:20 in the morning. 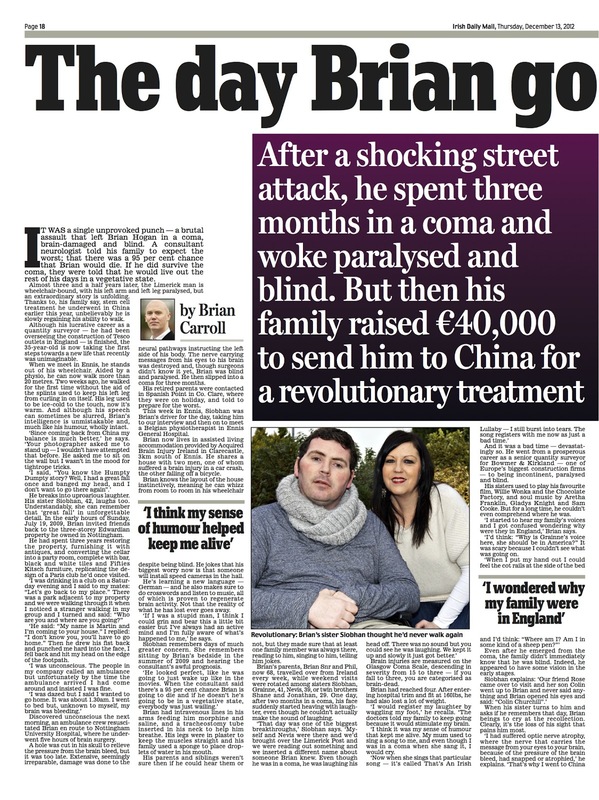 Grainne took Sean into Beijing while Shane looked after Brian. We saw Tianamen Square, the Forbidden City, and here's Sean at the crazy street market just off "Times Square." More insane food, pushy trinket hawkers, and a vast, tightly packed sea of humanity. It's been a great adventure and it'll be fun to come back to. We'd do it differently next time, but this has been a fascinating experience. And now we wait, hope & pray for Brian's new sten cells to work their magic! You know with Chinese food you'll just be hungry again in an hour. Finally got to see something cool! Sean & Grainne at the Forbidden City, the palace of Chinese emperors till the early 20th century. Found the first post office we've seen the whole trip! On the last day, naturally. It's been an adventure! Tonight is our last night in Qingdao. Brian got his last stem cells on Friday and he did fine. Results can take six to eight months to appear, so we'll be waitng patiently. We said our goodbyes to our new family in China, Juan, Carolina & Gaby and Farhan, Anita & Zahra. We've been corresponding with the rest of our family, Serar, Jawad & Baidaq and Claudio, Daniela, Brisa and Nacho, who are all back home in Iraq and Argentina. It's a tearful goodbye, but we'll always have our dear friends across the world! Brian is doing well. He's been working on his arm & leg exercises and doing well. In the morning, they'll be drawing one last set of blood work before we leave. We're off to Beijing in the morning; our flight leaves at 11:05 am. We spend the night there, then wing our way back to the Emerald Isle on Tuesday! We cannot wait!! Give us English, and coffee and soft beds and mom's lasagna and internet everywhere and text messages! Till tomorrow (or later today by your time - we're 13 hours ahead of New Orleans, 7 hours ahead of Ireland). Wish us well! First things first! Many, many, MANY thanks to Brian's latest donors! Sorry if these are a bit late, but receiving PayPal notifications is apparently a bit... unpredictable... here in China. Brian has completed all his stem cell infusions - 2 lumbar puncture infusions and 4 IV infusions. Now he waits. It can take up to six or eight months to expect to see any results. In the meantime, the staff here in China has given him some good physical therapy exercises to enhance the functionality he has already. Sean has also given him some brain exercises. For example, while holding an object in his weaker and less sensitive left hand, he's asked to identify the object. Then it's placed in his right hand to get a better feel and a more accurate description. Then back into his left hand to compare the two different sensations. He maintains good strength on his left side; coordination and finer motor control is the main hurdle. We've started reminding him to do minor tasks with his left side, such as scratching an itch or washing his hands. As he gets better with minor tasks, he's looking forward to skills requiring greater dexterity, like sculpture and calligraphy (though those probably won't develop this week). The other families went into Qingdao city tonight (Saturday). Grainne and Sean stayed behind in the hospital with Brian, but insisted that Shane go with the rest of the group (Juan, Carolina & Gaby from Colombia and Farhan, Anita & Zahra from USA). Shane has more than earned a little break for the night. He's staying in a hotel room in Qingdao to rest up a little bit with no heavy lifting, bathing or bathroom duties to wear him out. Shane has acted far above and beyond the call of duty when it's come to helping care for Brian. Thank you, Shane! While Shane is away, on Sunday Grainne and Sean are hoping to take Brian to the restaurant at the Holiday Inn where we stayed earlier this week for a little treat to the delicious lunch buffet there. All this adventure has been no easier on Brian, and he's earned a little treat as well. Monday we leave the hospital and fly back to Beijing where we'll spend the night in a hotel near the airport, then fly back to Ireland on Tuesday! China has been a great adventure, but every one of us is looking forward to getting back to Western culture (and a bed that doesn't feel like it's made of wood!). We heard from Serar, Baidaq and Jawad from Iraq. They made it home safely and they're back in Basra. All of them exclaimed how exhausted they were and they sent their love and best wishes to Brian and the rest of us! Mushallah to you too! We'll be keeping you updated! Thank you! Typhoon Damrey isn't much to talk about. We haven't heard any news about flooding or devastation, but then again, we don't understand Chinese so we wouldn't understand anyway. Here in Qingdao, it's been a little rainy and breezy; nothing to write home about (despite the fact we're writing home about it). Brian's last IV stem cell infusion is today! The nurses were in bright and early to start his IV. The nurse that's been doing his IV's is excellent at it. One quick stick and she's got it. Sean had to try twice for Brian's IV before the plane ride, and the nurses in Beijing had to try four or five times. So kudos to her! We leave Qindao on Monday for Beijing, where we'll spend the night at a hotel near the airport. Then Tuesday it's back to Ireland! China is strange, sometimes bizarre, but always interesting. We've barely picked up a word of Chinese besides "hello" (ni hao) and "thank you" (xi xia). We've always heard Chinese is the most difficult language to learn, and we do not doubt it. There are no common reference points. Even gesturing means nothing here in China. For example, if you were to show someone three fingers in the West, the other person would generally get the idea of "three." Not here. Even motioning "left" or "right" to the taxi drivers isn't always effective. It's a completely different mindset and view of the world that eludes us westerners for the most part. Being back home will be a most welcome experience. Stay tuned for more! The adventure continues! Not too much to report today. Brian developed a little fever today, but it was easily managed with a cool room, damp towels and a dose of paracetimol (Tylenol). He's in excellent spirits. He has one more IV infusion of stem cells tomorrow. Brian's left arm & leg are much easier to move these day. Not sure if that's from the stem cells or physical & occupational therapy, but hey, we'll take what we can get. No changes yet in his vision, but all the doctors have said that if he gets any results, they would be slower to develop. We've checked out of the hotel in Qingdao. It's was on the expensive side and it's more important to spend the available money on Brian's expenses while we're here in China. So we'll all be staying in Brian's hospital room. Fortunately he's in the larger "VIP" room, so there's enough room for all of us. The staff here told us that there's a typhoon heading our way. Typhoon Damrey. Sean and Grainne thought they might be getting break from New Orleans' hurricane season. We didn't really plan on landing smack dab in the middle of China's typhoon season, but here we are. People seem far less frenetic about their hurricane preparations here; everyone seems to be just going about their business as usual. 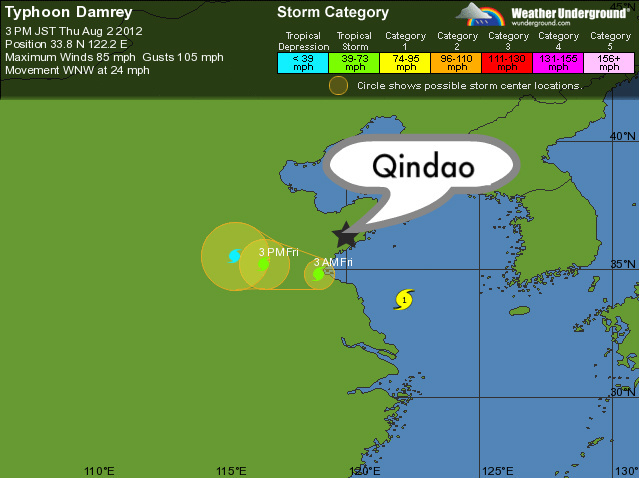 Damrey will apparently be passing just barely south of our position. We'll let you know how it goes! Stay tuned! Brian had his second lumbar puncture infusion of stem cells and his third IV infusion today! All went well! As before, he had to lie horizontal for six hours after the lumbar puncture. He did quite well; no pain, headaches or nausea. No fever either, though we've discovered that all the patients experience a fever after their first lumbar stem cell infusion, just as Brian had. The second time had no problems. He's sitting up now, having some supper that Sean cooked. Jonathan and Nevis left earlier today also. Nevis is heading back to Ireland and Jonny is heading to Germany for a few days' visit with his wife's family. We're so grateful for the help they gave and all the effort to travel so far to give the rest of us a little break, even though they never really got to see any of China. They had about a thirteen hour layover in Beijing, so hopefully they took the chance to take a taxi into town for a day of sightseeing. The new facility we are at in Qingdao has been a real boost to everyone's spirits. Qingdao is a beautiful city - there are several parks visible right out of Brian's hospital windows and the streets we've traveled down are all lined with lovely gardens. Plus they brew Tsingtao beer here; Shane is hoping to take a tour of it this weekend! Last night we had a little going away party for Jonathan and Nevis. We had supper at the restaurant at the Holiday Inn at which we're staying, then a cocktail or two in the hotel bar with Juan, Carolina and Gaby. There was a quartet of beautiful Filipina girls singing in the band and they dedicated "Rolling in the Deep" by Adele to Brian! A great time was had by all! On a culinary note, Sean has appointed himself the chef of the group. It's been a challenge catering to the various tastes of everyone, but so far there's been no problem. Today for example, we had some grilled pork, stir-fried veggies with a butter & oyster sauce over rice and curry chips (curry sauce courtesy of Nevis & Jonny's treats from Ireland!). It went over well. We only wish we knew what more of the items at the supermarket were; no doubt they'd be delicious! Brian just got back from his lumbar & IV stem cell injection. It was really quick, maybe ten minutes! Now he has to lie horizontal for six hours. He's listening to his audio books. So far so good!